Ken has sold this vehicle to Bob McDonald. The following is a description of the vehicle written by Ken before he sold it to Bob. 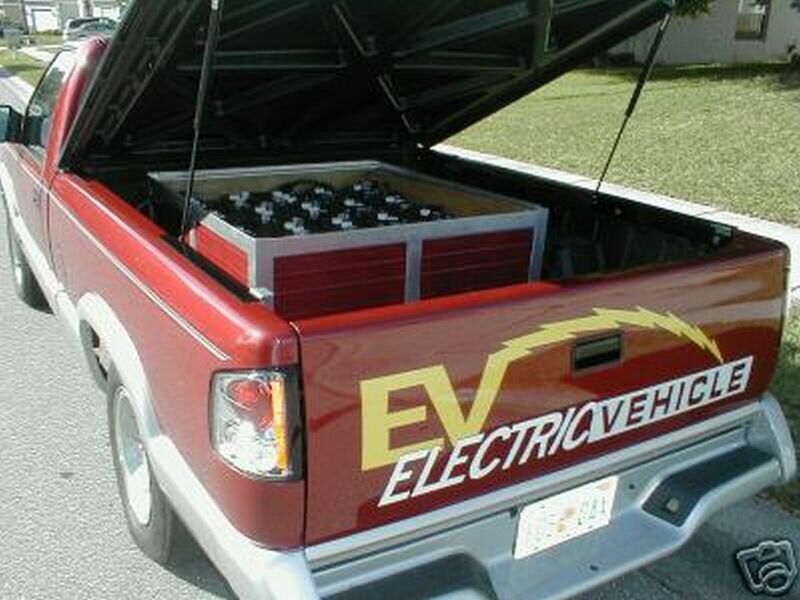 Attached are some pictures of my Electric Vehicle. I drive this electric vehicle to work every day. It is the most practical vehicle I have ever driven. It has no gas tank and has never been to a gas station. It has no engine and never needs an oil change. It has no radiator and never gets hot. It has no exhaust system and does not put out any pollution. It has no clutch to wear out. 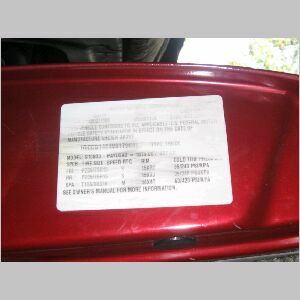 The only maintenance required is to check the battery water level every month or so and charge the batteries after each use. 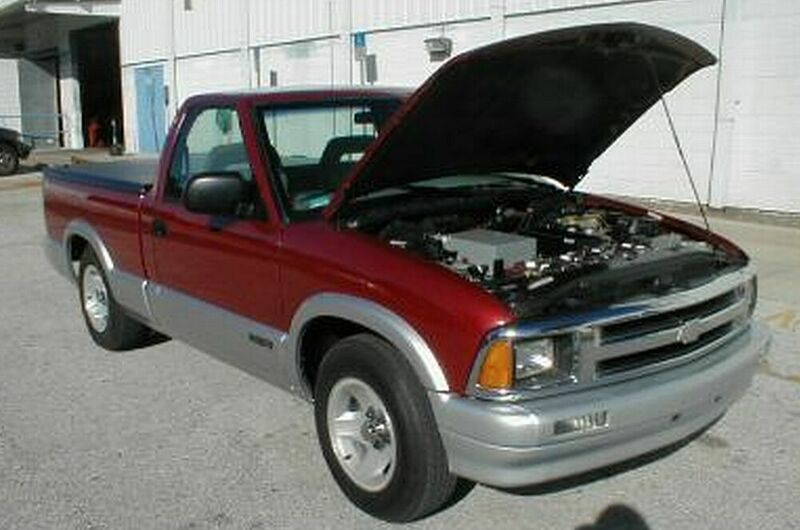 A used car lot located near where I work had a 1997 Chevrolet S-10 pickup. It had to be jump-started to get it off the lot but I knew that all I was going to need was the chassis. As soon as it was home in my garage, I removed the engine along with the clutch, radiator, muffler, tail pipes and gas tank. 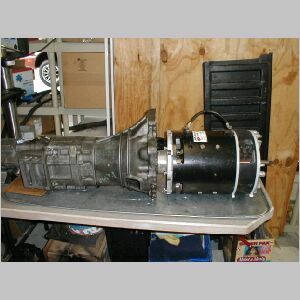 I saved the 5-speed transmission to reuse in the electric vehicle. 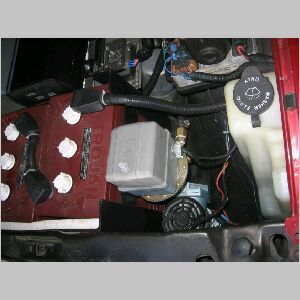 Research on the internet brought me in touch with the owner of a one-man company that sells parts for electric vehicles. 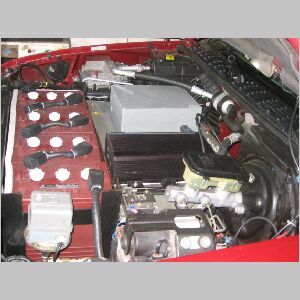 He provided the electric motor, speed controller and transmission adapter. During the next four months, I assembled these components and positioned them in the space where the old gasoline engine had been located. Over the electric motor, I built a deck to support the speed controller and electronics box which houses the high voltage components. The “fuel storage” in this electric vehicle is 24 deep discharge batteries of the type used in golf carts and each evening I plug them into a battery charger located in my garage. 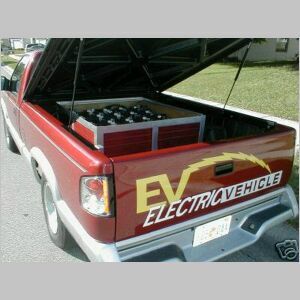 These batteries power the vehicle for about 50 miles on a charge. I actually have driven 53 miles on a charge. The Volt meter built into the dash, which acts like a gas gauge, shows how much charge is left. 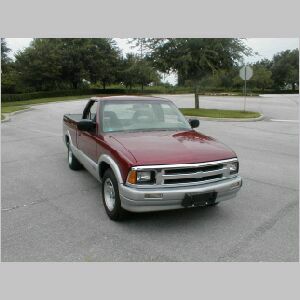 The truck has a top speed of 70 mph and can easily keep up with traffic. I drive it on the freeway every day. A charge costs approximately $1.50 and the batteries should have about a five year lifetime. Gasoline to drive 50 miles would be much more than that. 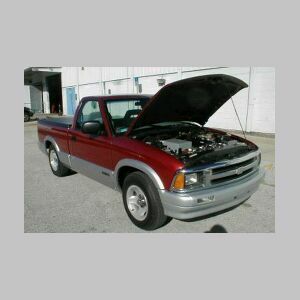 It needs no oil changes or antifreeze and has few moving parts so it should not need much maintenance. Since I began driving this vehicle, my monthly gasoline bill has gone down $200. 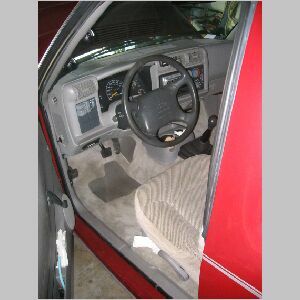 New paint, new interior parts and other vehicle additions made this electric vehicle perfect. 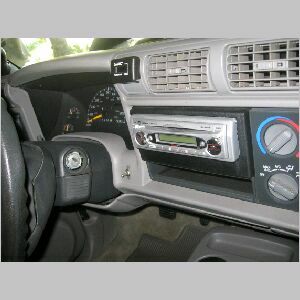 It is very easy to drive; turn the key on, put it in second gear and depress the throttle, at about 30 mph shift into third gear, no clutch required. The acceleration is good. For faster acceleration, take off in first gear and shift into second at 20 mph. The DC motor was adapted to the original 5 speed transmission. 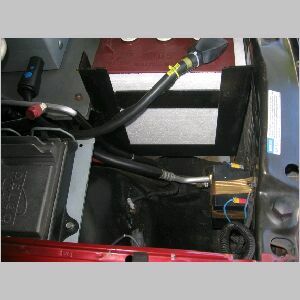 The twenty four, 6 Volt, deep discharge batteries were installed in welded frames. 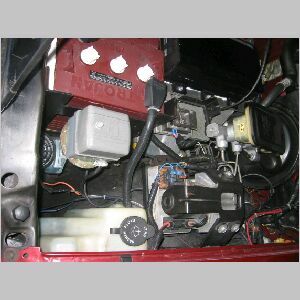 A motor speed controller was installed that accepts the throttle pedal input and adjusts the motor voltage to control the motor speed. Safety was the first priority, all battery connections are protected and the High Voltage wiring is run in conduit. 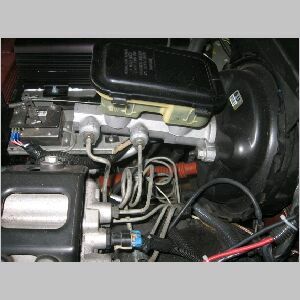 The motor control logic prevents the motor from starting when the key is turned on with the throttle depressed. 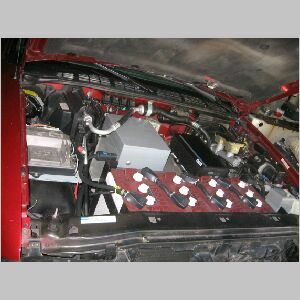 Next, a DC to DC converter was installed to convert the 144 VDC battery voltage to 12 VDC for the vehicle accessories. The Power Brakes are driven from an industrial vacuum pump and controller to insure maximum vacuum at all times. Air Conditioner power is provided from the front shaft of the DC motor. 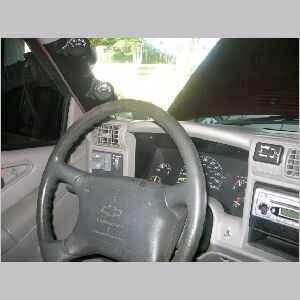 The AC works much better than original because there is no engine heat to overcome. The Battery Charger is completely automatic, just plug it in and forget it. 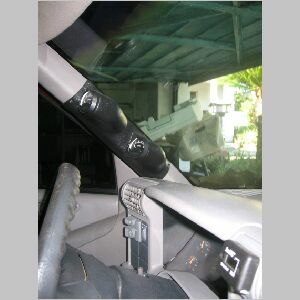 Air shocks are installed in the rear to equalize the vehicle level. 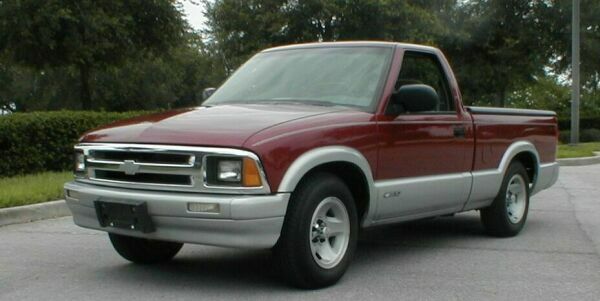 Due to the added weight, the ride is superior to the original truck. Instrumentation includes motor current, motor voltage, 12 VDC accessory voltage, motor speed in rpm, total motor on time in hours, motor temperature gauge, controller temperature gauge and vehicle speedometer. A new radio and new carpet were installed. 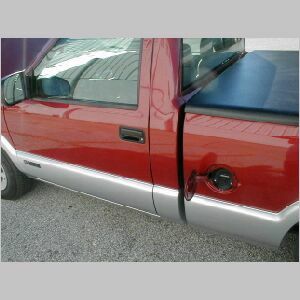 A complete paint job was done by a professional painter who first prepared the surface, then put on two coats of color, followed by three coats of clear, then he wet sanded the top clear coat and hand rubbed for a deep gloss finish. It has been extremely reliable and has been driven back and forth to work almost daily since it was built about 2 years ago. It is enjoyable to drive as well as being economical and environmentally friendly. It is so much fun building these Electric Vehicles that I would like to sell the one that I have now and build another one. Let me know if you know of someone who might be interested. This is Ken's current project. 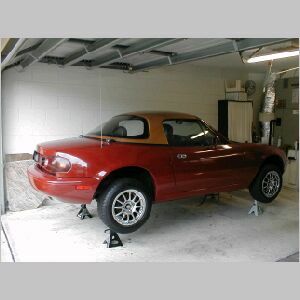 "I am now working on a Miata. I have an 11.5 inch motor and a Zapi controller. It is in my garage waiting on other EV parts to come in. I plan on using ten of 4D AGM batteries." This 11" motor is from a Caterpiller fork lift; the drive end of the motor has a 1.25", 24 tooth spline. I machined an aluminum hub with this spline on the inside diameter and then attached the center of the old clutch plate to this hub. This made a great adapter with no key ways or set screws. 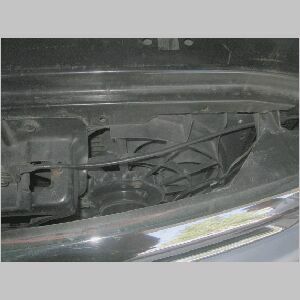 Notice that there are two levels of batteries in the trunk. 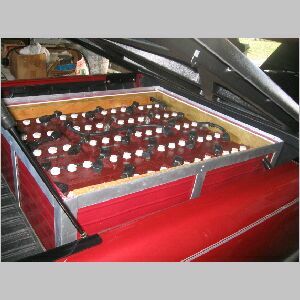 Seven AGM batteries in the front and eleven batteries in the trunk. The aluminum T shaped object in the firewall area is the motor controller heat sink. The motor controller is mounted to the other side. I used 18 ea. 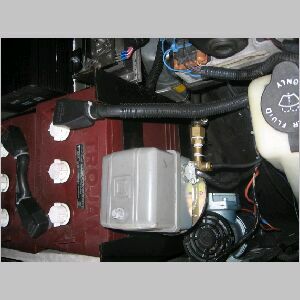 6 Volt Discover AGM battrties, 7 in the front and 11 in the trunk. They weigh about 1200 #. This has overloaded the springs. 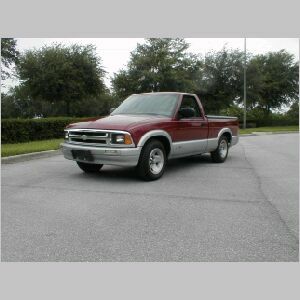 But, there are after market racing suspension parts available for this and I am now looking into buying stiffer springs. I am just about ready for a first drive. The only problem that I see is suspension overload.